As part of 400 Thunder’s on-going development to deliver the best possible service for race fans, sponsors and teams, three changes have been made to its already popular live streaming program. 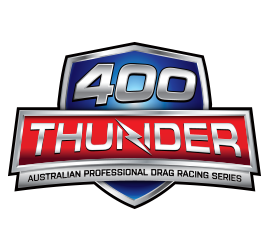 400 Thunder’s live stream service provides full audio and video from its national events, with viewers not able to attend the event still able to experience the thrills and spills of Australia’s premier drag racing series. The changes relate to a newly appointed service provider, a move to a pay-per-view system, and an adjustment to the geo-blocking policy to allow more viewers to tune in. The changes come into effect beginning with this weekend’s Coates Hire West Coast Nitro at the Perth Motorplex. The first is a switch in service providers, with respected industry leader 5 Stream appointed as 400 Thunder’s official live streaming partner. The second is a switch to a pay-per-view model with low cost of just $5.00 per day to log on, while the final change sees the end of the full state geo-blocking, which has replaced by a 300km exclusion zone around the event. The change in the geo-blocking policy will not affect event attendances, but allow more viewers to tune in, particularly in a big state such as Western Australia where fans thousands of kilometres from the Motorplex but still in WA previously missed out. Australian Professional Drag Racing Ltd CEO Maurice Allen believes fans will happily approve the changes, as they provide a better, more-easily accessed service to watch 400 Thunder events. “We are working hard towards bringing fans and sponsors a racing series and standard of service that Australian drag racing has never enjoyed before,” Allen said. The live stream from Coates Hire West Coast Nitro at the Perth Motorplex, featuring Round 2 of the 400 Thunder Top Fuel and Pro Bike Series, and Round 4 of Pro Alcohol, begins with qualifying TONIGHT at 8:45pm AEDT (5:45pm AWT). The event, and streaming will continue tomorrow night at 8:45pm AEDT. Live streaming can be accessed at our dedicated page – 400 Thunder Live Streaming. Cost is just $5.00 per night.